I just received an order of a newly introduced curved spoke wheels made in NZ by North Yard. They are designed to represent 1:64 scale 20 inch dia Edgar Allen Cast Steel (Sheffield) wheels. So what does that mean; 8mm dia plastic centre, blackened brass tyres to RP 25, code 88 profile. 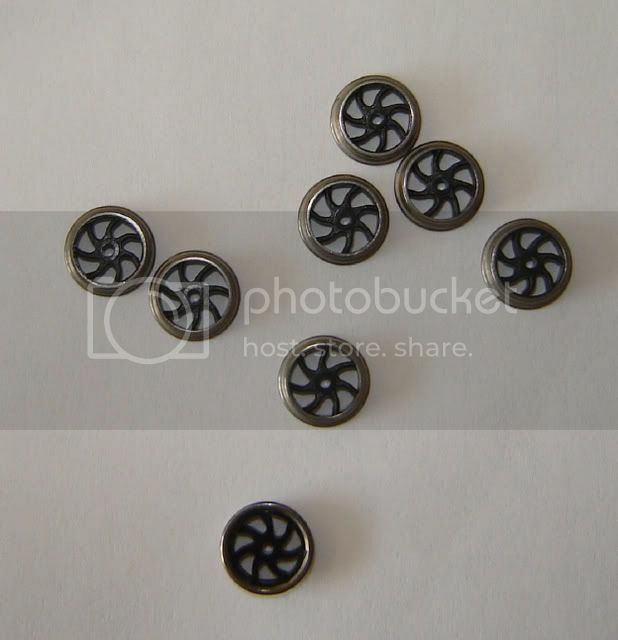 They are $NZ1.20 each part # 2163B per wheel. They are not mounted on axles as in typical NZ use they would have inside bearings. The required axle is 1.2mm dia (North Yard brass 501.12 x 300 mm = $NZ0.90. Email north.yard@xtra.co.nz. They do overseas orders and take credit cards. Mine were delivered 3 days after order. I'm just a satisified customer.